Microsoft has been providing its services in several fields, including computer operating systems, Office suite, software, emailing, and more for the past so many years, and today, each of us uses Microsoft’s products or services in almost all the fields it serves. As you know that Windows operating systems have been the first priority of computer users across the world, many users upgrade to the latest versions of these products and services whenever they are available. Some even switch to a different platform like Mac OS X and look for a similar product or service to meet their needs. Luckily, some Microsoft applications are available for Mac based computers as well, e.g. Microsoft Office for Mac. When somebody switches from a Windows based computer to a Mac OS X based computer, one of the primary features he looks for is the email client. Luckily, Mac OS X has an inbuilt email client, namely ‘Mail’ that he may opt for as the default one. Alternatively, he may purchase Outlook if he cannot compromise with the features he has been addicted to while on Windows. 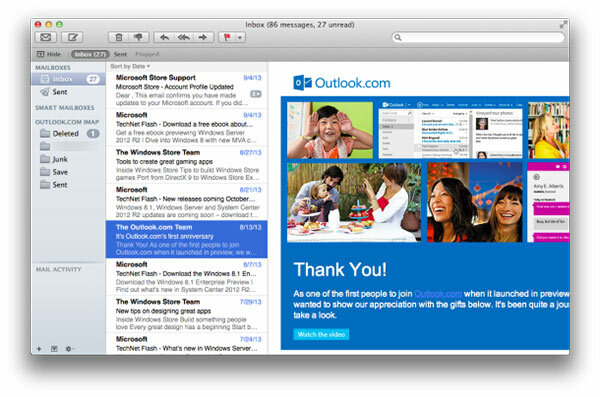 Those who use Microsoft’s web oriented emailing service – Outlook.com – can still use the same platform without having to change their email platform. In contrast, in case one has been using an IMAP (Internet Mail Access Protocol) account like Gmail, and have a strong desire for an email client other than Microsoft Outlook, he might be very much comfortable with Mail – Mac OS X inbuilt email client. Though it is not quite old news, you must be glad to know that Microsoft now has opened the doors for IMAP for its Outlook.com consumers who have been bound to Exchange ActiveSync. When it comes to using IMAP, it is not a quick and straightforward task to set up Outlook with IMAP in Apple Mail. The reason for this process not being straightforward is, either the missing configuration settings that are required or the choice is nothing but POP (Post Office Protocol). Since the protocol is unchangeable, setting IMAP account on Apple Mail is quite difficult, and thus requires a bit of trickery. In case you are ready for it, you must first be familiar with what is mentioned below. 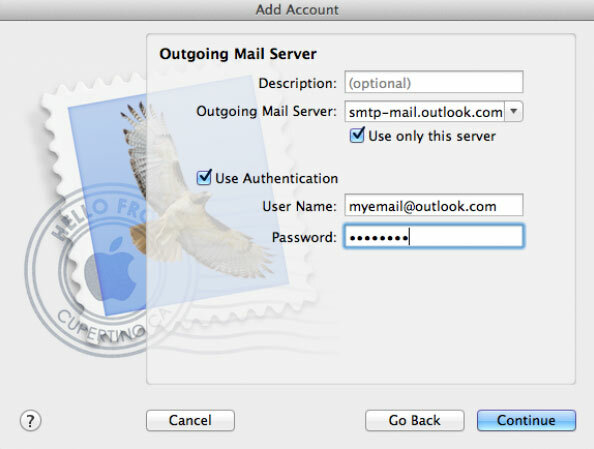 Furthermore, in case two-factor authentication is enabled in your Outlook.com account, you have to create an application specific password, and then use it to set up Outlook.com account using IMAP in Apple Mail. Meanwhile, you have to keep the window showing the application-specific password; or else, you may note it down on a paper so that it is easily accessible. See how you can create application-specific password in Outlook.com. Launch Mail navigate Mail > Preferences, and then choose your account. Provide your original Name and info as they are at Outlook.com below Email address. 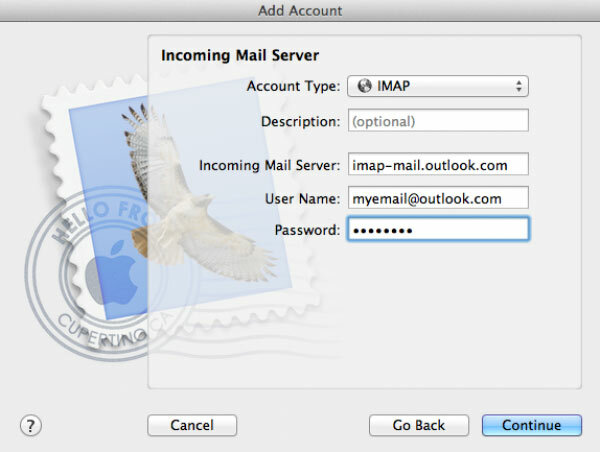 With this, you are done setting up your Outlook.com account using IMAP on Apple Mail.